The hours are ticking down to one of the big events of the summer — the opening of Harry Potter and the Deathly Hallows, Part 2. Thousands of fans will be in movie theaters tonight at midnight for the first showing. Millions of us worldwide eventually will watch the movie — but at a more standard viewing time and without wearing robes or carrying wands. I wasn’t one of the first to discover Harry Potter. The second book (Harry Potter and the Chamber of Secrets) had been published before I decided to read the first book (Harry Potter and the Sorcerer’s Stone). I’d concluded that I’d better find out about Harry Potter because my college students often made reference to Harry Potter and Hogwarts. And like many, I found the first book magical and kept on reading. 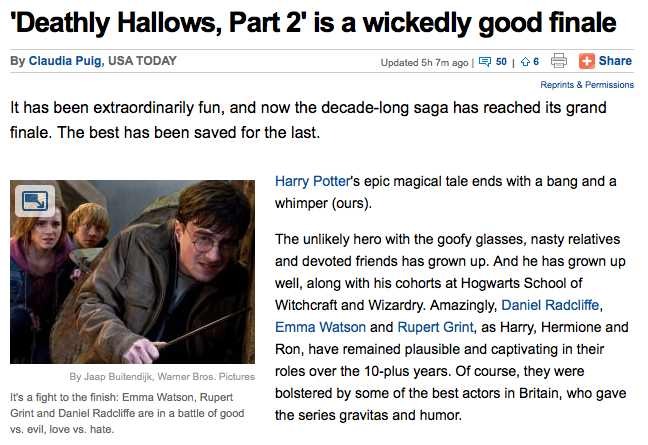 I appreciate J.K. Rowling’s storytelling ability with characters and plots that work for readers of all ages. And I appreciate the series for promoting the enjoyment, learning and personal growth that reading provides. In a day of video games and the Internet, Harry Potter has created avid readers of books. I also have enjoyed Rowling’s insights into the educational process. She has portrayed some of the icons of our school experience — from the teachers who create the thrill of learning (such as Professor Lupin) to the teachers who squash the desire to learn and promote discontent in the classroom (such as Professor Umbridge).